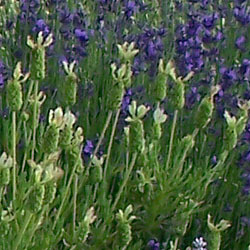 This cultivar is actually a Spanish lavender hybrid. The corollas on the sides of the flower spike are a soft violet color and the top bacts are greenish white. The foliage is bright green.